It was early morning when I met with the Ferrin brothers. TJ, the younger of the two, ushered me inside his family’s three-story furniture store and provided a quick tour of the facility before we sat down at one of the many comfortable arrangements on the main floor. Andy soon joined us. We chatted about the store’s history – about the multiple generations of Ferrins who have run the business and about the building’s history prior to being a furniture store. We discussed the challenges and importance of running a local business. We talked about the furniture store’s role in Great Falls’ downtown community. Just after 9am, phone calls and emails began to come in and it was time for Andy and TJ to get to work. And so, I spent the rest of the day exploring the building’s many stories . . . in both senses of the word. 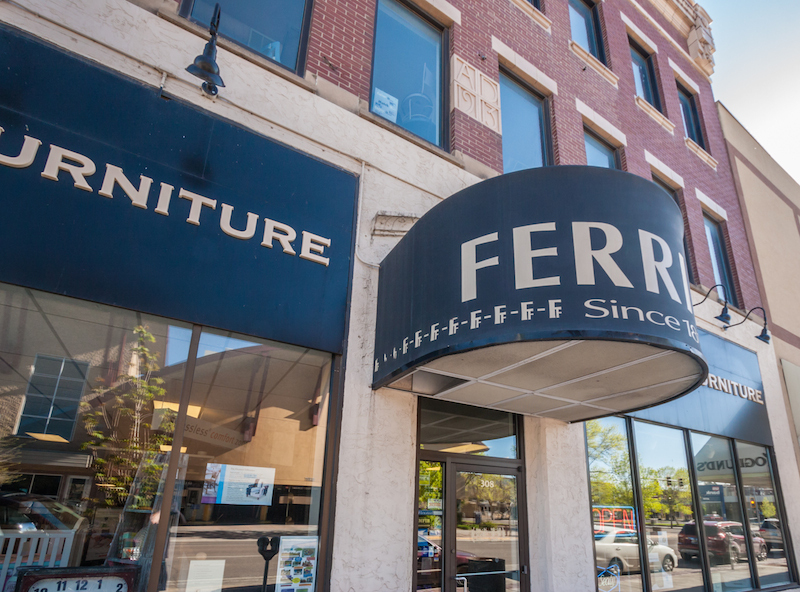 In contrast, the ground floor of Ferrin’s Furniture feels very modern, partly because the interior has received several renovations over its lifetime and partly because the store is brimming with contemporary furniture and décor (though some of it borrows from the styles and trends of yesteryear). Just inside, to each side of the door, are two window front displays. To the right is the front desk and just ahead is a wide stairway leading to the upper floors. The ground floor contains sofas, recliners, coffee tables, lamps, artwork, shelving, and more. An engine red hutch with barn doors catches my eye, as does a poker table display, complete with realistic looking beer mugs and hot wings. These scenes can be found throughout the store and really help a customer imagine what the items will look like in their own living environments. The Ferrins find this aspect of their business so important, in fact, that they employ decorator Josie Carter to work (almost exclusively) on maintaining the displays. In many ways, the store is like an art gallery with a natural flow to it. With the staircase in the middle of the building, the floor wraps around in a continuous track. A person can follow it to the right, around the store, and eventually be led back to the front, at which point they have two options: go up or go down. The basement stairs are off to the left of the building’s entrance and lead to a room filled mostly with office furniture. Like the building’s history, the basement is not evident without some exploration. When the three-story structure opened in 1913, it contained three businesses – Theodore S. Coy Furniture, Victor Ario Saddlery, and the Belmont Hotel. The complex was developed by Richard Graham, a flour miller who saw Great Falls’ expansion as an opportunity to make some supplemental income. It was a successful enterprise; the Belmont’s rooms were small, maximizing the number of tenants and thus, the amount of rent being paid. The furniture store moved out in 1916 and the saddlery left in 1931, but at the time of Graham’s death in 1933, the Belmont remained, and continued to remain for decades. Sandy Ulman lived at the Belmont in 1957. She was eight-years-old, had two younger siblings, and her mother worked there as a maid. All four of them stayed in one room on the second floor (to the left of what is now the Ferrins’ office). It was cramped, with one dresser and one bed, but it was home to Sandy. Between two marriages, Sandy’s mother had fifteen children and gave them all up for adoption. Sandy has since reconnected with twelve of them, including the two she grew up with at the Belmont. Although she remembers the area as being somewhat of a skid row, her memories of the Belmont are mostly joyous ones. Others’ recollections aren’t quite so charming. “At one time, the apartments on the second floor had the appearance of having a brothel,” says George Willett, owner of central Montana’s Showdown ski area. In the early 1960s, he worked for Macintosh Men’s Store in downtown Great Falls and was often asked to make deliveries. Sometimes he’d deliver to Leo Lemar, who was then the owner of both the Belmont (which was at that time called the Lemar Hotel) and the Caravan Club, an establishment well-known for its debauchery. George recalls it being pretty obvious to him that the women there were prostitutes. “I would go on up and wink at the girls but that’s as far as it went for me,” he laughs. By that point, prostitution at the Belmont complex was nearly as old as the building itself. The police had been periodically raiding the place for years and often the crimes were made public in the local newspaper. “Politicians would get on these guys every three years or so… usually when they were up for reelection,” says Ike Kaufman. Since 1895, his family has owned and operated Kaufman’s Menswear in downtown Great Falls. Their business is only seven years younger than the city, and as such, the Kaufmans have served as unofficial keepers of its history. It’s clear from talking to Ike that he not only knows Great Falls’ history, he enjoys it. He shares with me stories of the Belmont, its seediness, and the general depravity that permeated the area at the time. It would be many years before the Belmont’s prostitution problem would be resolved. By 1981 the Belmont was gone entirely. Since the complex opened in 1913, more than a dozen businesses had set up shop there, including four furniture stores. In 1997, Ferrin’s Furniture became the fifth. The second story of Ferrin’s Furniture is even more evocative of an art gallery than the first, the reason being that many of the Belmont’s walls are still intact, dividing the various furniture sets into their own vignettes. It isn’t difficult to picture the building as a hotel; Ferrin’s layout builds upon what was already there, embracing the history of both the building and the family business. In 1899, years before Richard Graham developed the Belmont complex, John J. Ferrin founded Ferrin’s Furniture in Red Wing, Minnesota. His son, Frank, joined the business in 1906 and the business expanded into two additional buildings. Ferrin’s Furniture grew yet again in the 1950s, after Frank’s sons, Joe and Frank Jr., joined the family business, and in the 1980s, Frank Jr.’s children, Bill, Anne, and John became the fourth generation to run Ferrin’s Furniture. Then came what was, perhaps, the greatest expansion in the history of the business; in 1997, Bill Ferrin brought Ferrin’s Furniture to Great Falls, Montana. With his wife, Sue, he ran the family-owned, independent furniture store for nearly twenty years. In 2016, he turned operation over to his sons, Andy and TJ. I made my way from the second story to the third, met with even more furniture options. I looked around at the bedrooms, beds, futons, and dressers. When I got to the south side of the floor, I showed some restraint, deciding it best not explore the storage area without supervision. TJ had given me a tour of this area earlier. He showed me some of the old hotel rooms (that were more-or-less unchanged) and pointed out the original carpeting in the hallway and other features from the days of the Belmont. He even showed me the doorway in back where he and Andy would throw paper airplanes as kids, watching them drift down, down to the ground below. Having grown up in the furniture store, working here was always an option. When Bill retired, Andy took over inventory and marketing, and TJ began managing day-to-day operations. “I’ve been fortunate enough to have a career laid out in front of me if I wanted it,” says TJ. Bill never forced the business on his kids – it wouldn’t be the first time a family member chose a different career path – but he’s proud to see them carry on the family legacy of their own volition. One of Ferrin’s slogans is “five floors of furniture.” Under the impression that there were four stories, I became confused to find no stairs leading upward from the third. As it turned out, I had bypassed the mezzanine, mistaking a descending set of stairs on the second story for an alternate route to the ground floor. The Ferrin brothers believe the mezzanine was designed by a prior furniture store tenant to better serve the business and its customers. The floor creates an attractive area with additional room for merchandise. The Ferrins use it to display sofas, chairs, and other items, most of which can be customized to suit a customer’s needs. Because Ferrin’s Furniture carries higher end merchandise, people sometimes assume that it’s too expensive. This is a perception that many local businesses have to fight. While corporate stores may be able to offer low prices on their products, the quality is often just as low. In contrast, merchandise at Ferrin’s Furniture is built to last and it’s competitively priced. They can also offer that personal touch that’s hard to find outside of a local store. “Most customers are appreciative of our free local delivery and we can help move their current furniture to the garage or wherever for a relative who’s going to pick it up,” says TJ. Although the Ferrins specialize in custom orders, they do sell in stock items off the sales floor. That may not strike you as being an exceptional service – that is, until you realize that the century-old building has no elevator. It’s a labor of love running the old furniture store. And Great Falls is the better for it. Of the five floors I explored, the third story was probably my favorite, simply because of the view. The north facing windows look out on downtown Great Falls, a community within a community. While Andy and TJ run the furniture store, their mother has gone on to operate Belles & Lace Bridal with TJ’s wife, Courteney Ferrin. The businesses provide widely different services, but both are dedicated to helping downtown flourish. Andy isn’t just talking about the shopping opportunities his family’s stores afford the public. Like many downtown businesses, Ferrin’s Furniture and Belles & Lace are active in public events and gatherings. Andy even serves as President of the Business Improvement District, and Sue is chairwoman of the DGFA. It doesn’t matter how large a community is; without visionaries, leaders, and volunteers, it can quickly fall on hard times. The Ferrins are among those who have stepped up to ensure that downtown Great Falls thrives. And that its many stories continue.